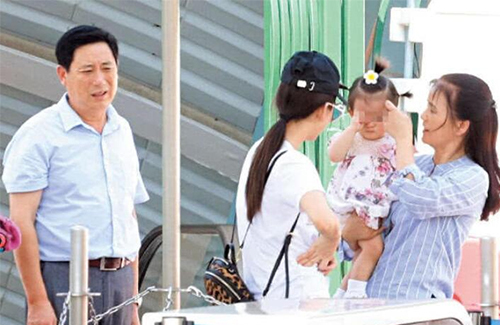 Rumored to be pregnant for a second time, Aaron Kwok’s (郭富城) wife Moka Fang (方媛) was recently spotted at Ocean Park Hong Kong with her daughter Chant and her parents. According to a source, Aaron asked Moka’s parents to temporarily live in Hong Kong in the meantime to help Moka look after Chant. With two films under his belt, Aaron isn’t readily available for fatherly duties. At Ocean Park, Moka was seen wearing a simple white t-shirt and jeans. Though rumored to be pregnant, Moka does not have a protruding belly. They proceeded to walk out of the parking garage and into the park, with Moka’s mother holding Chant. The one-year-old immediately threw a tantrum after leaving the car, and cried for her mother. After about a five minute discussion, the family decided to leave Ocean Park. Currently, Moka’s parents are residing in a rented apartment near Aaron’s own home. 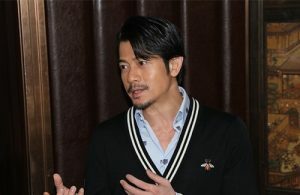 Rumors say that Moka isn’t getting along with Aaron’s own mother, but the 52-year-old denied them at a recent press banquet for his upcoming film I’m Living It <麥路人>.